The annual exhibition hosted by the Barber National Institute has, in its short existence, become one of the most important art events in the greater Erie area. This 5th annual Celebrating the Possibilities is being sponsored by Dr. and Mrs. Robert Guelcher, allowing the exhibition to remain both open to artists without an entry fee—a rarity—and free and open to the public. This would be great enough, but there are also three receptions: an Adult Artist Reception, a Wine and Cheese Reception, and a Reception for Young Artists, which will include various family activities. This exhibition was created to coincide with Autism Awareness Month, casting attention to the spectrum disorders and not only the needs of people with autism, but also the contribution of autistic individuals to society (it has been suggested that every great innovation improving the human condition was contributed by a person showing symptoms of some degree of autism). In this exhibition, professional artists, amateur adult artists, children, and persons with disabilities in all categories show together without discrimination. The only real differentiation made are in the juror's awards; "Adult Professional," "Adult Amateur," and the "Youth Award." Add to this a "People's Choice Award," where anyone can cast a vote for their favorite piece, and you have a uniquely community-based event. There were about 280 artists who entered—each being allowed up to two pieces—however for reasons of space, the committee cannot guarantee showing more than one piece per artist of the some 534 total pieces. Anything previously shown in this show is not accepted back in order to keep the show fresh each year. However the prospectus states that any piece previously submitted, even if it didn't make it for lack of space, cannot be entered another year. This makes no sense to me, and is a rule that I think they would do well to eliminate. They also have a censorship clause, which I ordinarily would object to, but being that the clientele of the Barber Institute have such a wide range of cognitive development, it is understandable. Noticeably absent from this rule, however, is the clause: "reserves the right to declined without comment," presumably meaning they have enough integrity that if deemed warranted, for example, would explain that the work in question was considered potentially too scary and upsetting for their population, thereby allowing the artist to better plan for the future. The signature piece, "Our Neighborhood," is a collaboration of five artists, each responsible for a different part of production, with the assistance of art director Frank Fecko. The background is modulated layers of blue creating an overall depth and texture, which then is carried through the buildings. They were initially cutouts meticulously arranged—then each piece stippled with pigment and stamped onto the canvas, the windows likewise. The buildings slant in different directions causing dynamic diagonal lines. The effect suggests to me that the buildings may be "rocking-out" to loud music. One nice thing about this show is the young people's exhibit, where the success of these pieces should be judged on how well the work shows the child's worldview, and NOT how close it has come to adult work. One such piece is "Bubble Gum Machine," a tempera on paper painting by 8-year-old Sophia Mercado. The space is used well, it is clear what the subject is, and the color is good enough to eat. Another of these 181 pieces, though clearly a young artist coming into adulthood is Caitlin Gleson, age 17, whose large "Self Portrait (Veiled)" is a sophisticated handling of a limited pallet—essentially earth tones—with a convincing illusion of the veil when one steps back to let the eye do the blending. The 353 adult pieces range in experience from seasoned veterans to those who have never shown before and a full range of media and skill levels. One of the more intriguing pieces—and artists—is "Field of Flowers" by Paul Wisniewski, who is a member of the Barber Institute's "Wheels in Motion Program," one of the best kept secrets in Erie. He has selected a palette of harmonious tertiary colors, applied with sponges, either thrown or mounted on a stick, and to make clear that impressionistic flowers is the intent, a few stems are created by pulling a paint soaked string at desired places. One of my favorite sculptures is Rebecca Merry's "Feeding an Idea," where obsessively created paper birds tear apart a book to feed a fledgling winged paper light bulb about to leave the nest. New to me is Sheryl Yeager, whose pastel piece is an oddly harmonious combination of colored shapes, which have the added delight of forming an abstract "Proud Elephant." 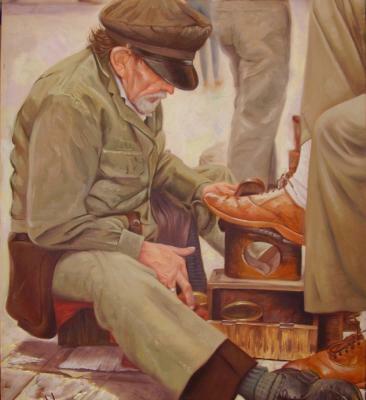 Also new to me is Ali Nashni Al-Deifi, whose "Shoe Shine" is a carefully observed and rendered piece with a creamy handling of the paint, great detail where needed, and eliminated where it isn't. It is a shame to have to note that in planning this very worthwhile exhibition, no one checked the calendar to avoid the holiest week of the year to a significant percentage of Erie's citizenry: Eastern Orthodox Great Week and Pascha. However they apologize for the oversight, and in the spirit of community, promise to be more careful in the future. The Dr. and Mrs. Robert Guelcher Art Show is at the North Lobby of the Barber National Institute, 100 Barber Place; Thursday, April 12, 5 to 7 p.m. Adult Artist Reception and Awards; Friday April 13, 10 a.m. to 7:30 p.m. (Wine and Cheese Reception, 5 to 7:30 p.m.) Saturday April 14, noon to 3 p.m.; Sunday April 15 (Youth Artist Reception and Awards) Monday April 16, 2 to 6 p.m). Admission is free. Tours for schools, seniors and other groups are also available by calling 874-5603. All visitors can vote for the People's Choice Award to be presented after the show.